Aerial photo maps, topo maps (topographic), local road maps, BLM maps and US Forrest Service maps are indispensable for doing scouting from afar, or at a hunting site. Some hunting maps can be viewed online and printed for free, or printed copies can be ordered. They can be found on one single site, Mytopo.com. Waterproof copies of maps can be ordered. Mytopo.com makes it VERY easy to do online scouting of your hunting location from a computer anytime, anywhere. You can waste a lot of time online trying to open separate websites with aerial photo maps, topo maps, BLM maps and road maps all at once. I have! 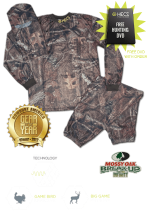 The goal of this page is to get you to free hunting maps quickly and to make the whole process easier for you. 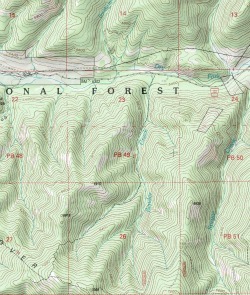 Mytopo.com has free to view and print USGS topo maps, high resolution aerial photo maps and hybrid photo/road maps. Customized “TopoPhoto” maps, as well as BLM maps are also available. In addition to motor vehicle roads, these maps will show you roads and trails that are closed to motorized travel on the national forests on which you can traverse by foot or by mountain bike (sometimes bikes are excluded in Wilderness Areas). You will need to compare them to the simple Forest Service Motor Vehicle use Maps discussed below. ..all without having to wait for the page to reload. The change is instant from one view to another. The new view is in exactly the same place as the previous view was. So, if you are looking at a spring on the topo view, you just click on “Hybrid” as you keep your eyes in the same spot. You will instantly be looking at an aerial photo of the same spring. If you want to see a simple road map of the area, just click on “Map” and all the distractions are removed instantly. 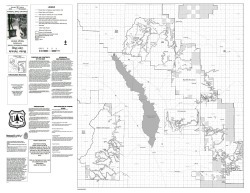 US Forest Service maps can be found and purchased online, but are a little harder to locate. (Well, it is the government!) If you hunt on the national forests, these maps will show you travel routes and boundaries. Motor Vehicle Use Maps (MVUM) tell you where you can drive and what kind of motor vehicle travel is allowed in an area. You can view these online. Forest Service MVUMaps are simple, with little detail. They mostly just show roads that you can travel on with specified kinds of motor vehicle travel. They do not have terrain information like aerial photo maps and topo maps do. You need to be able to see the non-motorized travel roads behind locked gates that you can hunt from. To see those, you can compare the MVUMap to an aerial photo view and topo map of your hunting area at Mytopo.com. I would recommend that you take at least an 18 X 24 inch waterproof topo map, with your hunting area centered on it, in your pack. Those are available at a very reasonable cost of $9.95 at Mytopo.com. Color aerial photo maps and larger sizes, or laminated versions cost more. Or, for $29.95 a year you can have unlimited map browsing, printing, and downloading of topo maps, aerial photo maps, hybrids, and map tools. You can even add GPS files to your customized map. 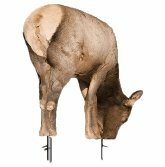 At Mytopo.com you will also find maps of state and species specific hunting unit areas or GMU boundaries on Bureau of Land Management (BLM) maps that show public land ownership boundaries. Mytopo.com has become a convenient one-stop shop for personally tailored, free hunting maps that you can order waterproof prints of at a reasonable cost. You can “center” your hunting site on the maps you view and order them. This eliminates having your area on the edge of a quadrant map, or continued on a separate map. For Montana there is a site with a thorough, but slow and cumbersome, private and public land ownership mapping system. It’s called Montana Cadastral Mapping. Start by clicking on “Property Map”, but be forewarned it is a little frustrating to get drilled into all the features you want to view, including aerial photo maps and topography maps. Once you get it like you want it, if you do something “wrong” it zooms back out and you get to start all over. I’m not sure what causes that, but it’s frustrating and time consuming. I like to use it to find out the names of the owners of private land where I’d like to hunt. Sometime you can find out whom to contact for permission to access their property. If anyone knows of something similar to Montana Cadastral Mapping in other states please send me a link via Contact Us and I will post it here. Google Earth is a satellite view of the entire earth used to create aerial photo maps, or just for viewing. One benefit of going to Google Earth to see your hunting area is that you can do a “fly in” by tilting the view. The fly in gives you an idea of the terrain of the area by appearing that you are flying just above it. To do this, click on the navigation arrows at the top right corner of the view area. For aerial photo maps, topo and other hunting maps, Mytopo.com is much better than trying to look at other map sites alongside Google Earth. I have spent many frustrating hours on Montana Cadastral Mapping and Google Earth, with BLM maps in my hand, before I learned how easy Mytopo.com made the process. You can pick how close to zoom in or out, give your map a title and other customizable features. The map source date is clearly indicated, so you know how “fresh” the aerial photo is. It even calculates how many acres and square miles your map includes.